Climbing Gunung Raung in East Java. I have tried to cut and paste a set of posts from Thorn Tree on Gunung Raung I believe are definitely worth reading, having been written by travellers who have climbed this mountain in recent weeks. However, this has proved impossible so here is the link to the posts- suggest all travellers interested in this article do your own 'cut and paste' because posts do disappear from TT after a period of time. Just bumping this back onto the front page so travellers can read the correct post. Sorry the first one did not work. I have also tried this but it was working. I think you are facing some problem because of the jpg images that are located at the end of links shown in the post. Do try again without copying the link. The cut and paste version. 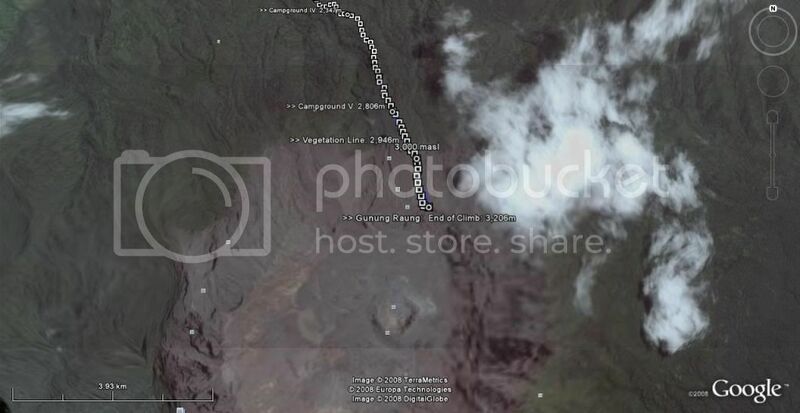 Several internet entries list gunung Raung as the most enjoyable volcano climb in Java, no doubt due to stunning views of its caldera and crater. I would have loved to have brought you fotos of these views which are indeed stunners, but regretably my camera went missing somewhere along the descent. Needless to say, Raung�s caldera and the crater contained therein are awesome, on par, albeit on a smaller scale, to the views at Bromo and Rinjani. Fortunately I didn�t lose my GPS which came in handy in finding my way to the top. Access to the trailhead is from the north, requiring a climb due southeast. From Bondowoso take the road heading to Situbondo via Wonosari. A right turn at the intersection at (S7 52.584 E113 54.648) leads to Sukasari. At Sukasari a sign points straight ahead to desa Sumberwringin. Keep going on the paved road past Sumberwringin till you come to a fork in road marked by a big antenna tower. Follow the road to the right which quickly degenerates into a stone track. That stone track will bring you eventually to another fork. This time take the road on the left side. The road will then degenerate into a dirt track, with some soft and steep patches in a pine-tree forest. At (S8 02.388 E114 01.282) the road ends, and the trail begins. You can park your vehicle here. You can probably find public transport till Sumberwringin. Thereafter you�ll have to hire an ojek. Due to the poor road surface and the distance to the trailhead, I reckon they�ll ask no less than Rp.$50,000, likely more. For cars, clearance and higher profile tires are more of a necessity than 4WD. Those soft patches of dirt in the pine-forest will stump weak-engined or low-clearance vehicles. Despite internet reports, it is not necessary to hire a guide. The trail is clearly visible, the only challenge being that the vegetation is over-grown in many places. Judging from the thick brush, relative absence of garbage and the fact that I saw not one soul in two days, I�d say very few people climb Raung every year. In some places, the trail forks and you�ll have to use your intuition. Keep in mind that you need to head southeast. When in doubt, take the fork that keeps climbing. There is one instance, however, where this will lead you down the wrong trail. That spot is at (S8 03.163 E114 01.925). Here you will wish to take the right fork even though the trail descends (momentarily). The trail slope is pretty mild till at about 1,800 masl where, from the trailhead, you will climb about 550 meters over 5.5km. Thereafter till the peak, you will climb roughly 1,400 meters over 4.5km. There are several campgrounds along the trail. By campground, I mean places where the trail widens and levels to allow pitching a tent. By far the nicest of the campgrounds, the one where I recommend that you set up base camp is Campground IV at 2,347 masl, roughly five and half hours from the trailhead. At 2,949 masl you are finally above the vegetation line. There�s a grave a few meters beyond, presumably of someone who perished on the mountain. Exposure and hypothermia are a real risk so do come prepared. Once you are out of the vegetation, there is nothing to shield you from the wind. I wore a baclava, gloves and a fleece vest beyond the vegetation line even though there was no a cloud in the sky and the sun was beating on me. The peak--the top lip of the caldera, really�is still one hour ahead along exposed, weathered rock. Except for patches of scree, the going is good due to good traction and footholds. On the other hand, by then you will have started to feel the increasingly thin air. Not a big deal, but it�s there nevertheless. All told, reaching the top will take about seven and a half hours of climbing at a quick pace. Garmin GDB file is available on request. Once again- another brilliant post from you with loads of valuable information- esp. on unusual places. Thank you so much. Sorry to hear about your camera-what a bummer. Keep these posts coming- I enjoy every single word/photograph/link and I am sure other travellers do as well. Later I will cut and paste this over to Indahnesia.com so it will never be lost. interesting...last month I hiked Raung too. Here some more information about this fascinating mountain. From Jakarta, you can take air-con bus from Rawamangun terminal to Jember. The bus starts around 1pm and will be arrived at Jember (east java) next day around 9am. I choose Lorena bus, and it will stop at its pool in front of Terminal Tawang Alun in Jember. From Tawang Alun, actually you have to take 'angkot' to the next terminal, Arjasa (still in Jember) then from Arjasa take the bus to Situbondo, stop at Gardu Atak junction (2 hours from Arjasa). Or you can hire 'ojek' to take you directly to Gardu Atak from Tawang Alun (1 hours). 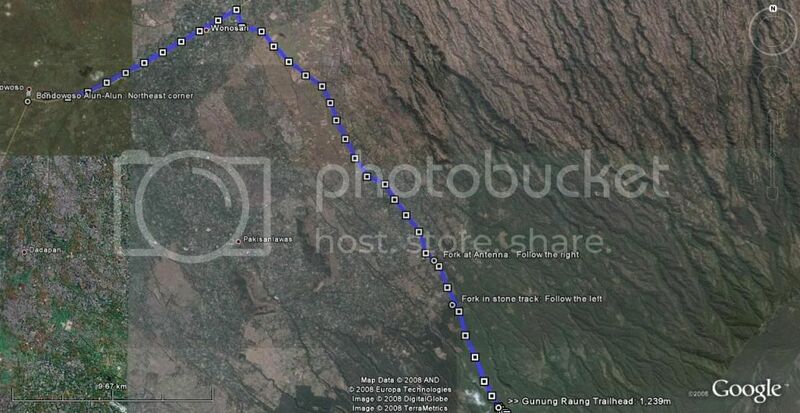 From Gardu Atak, take the blue angkot to the village of Sumberwringin (30 minutes). You can hire guide at Raung basecamp post of Sumber Wringin. Or you can sleep at its bungalow. From Sumberwringin, hire ojek to take you the starting point of Raung trek (Pondok Serani, 1 hours). The trek will be quite clear from here, but at some point the trail forks (always choose the right way, as the left trail will steer you to other montain, Gunung Suket. Suket is still wild and not many people go there). 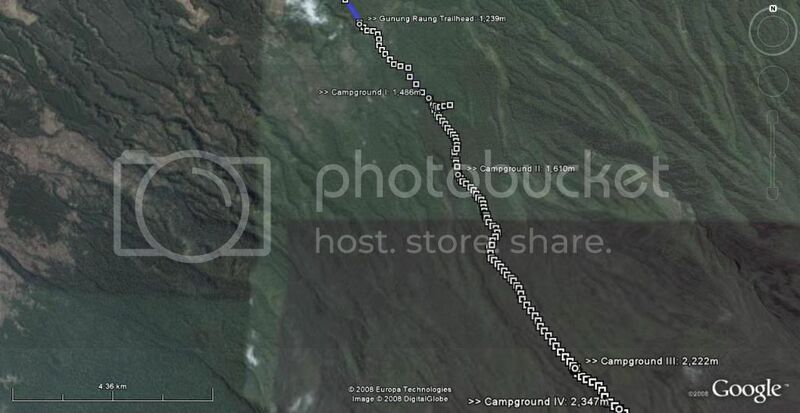 The best site for camp is pos IV or Pondok Angin (Wind Hut). From pos IV, 10 minutes walking you will see the remains of Deden Hidayat memoriam. This hiker from Bandung died after falling into Raung caldera in 1993. After that the trail will be quite dangerous, especially when its raining and windy, as you have to walk up and down with deep ravine at right and left, with scrambling at some points. Be careful also when hiking down. There are no water in this mountain, so you have to prepare.